A new American company that makes the strongest tents on Everest has just launched this new line for backpackers. They’re as light as anything else out there, but much stronger, much more livable and, believe it or not, cheaper too. We took one up the highest mountain in the lower 48. The 2Lite is a two-person, three-season, ultralight backpacking tent that, unlike most other products which meet that description, will comfortably sleep two people. Packed in its drawcord stuff sack, with a full compliment of aluminum stakes and guy lines, the entire package weighs in at just 2lbs, 14.1oz. In apples-to-apples comparison, that makes it just 14oz heavier than the lightest widely-available 2P tent — the $550 Big Agnes Fly Creek 2 Platinum we tested last Christmas —and 4oz lighter than our previous favorite 2P backpacking tent, the $400 Big Agnes Copper Spur UL2. All three of those tents set up with included poles. Sling fin also makes a version of the 2Lite that uses trekking poles for support. The 2Lite Trek weighs just 2lbs, 10.1oz and includes shorter poles for both the tent’s head and foot. The real genius of the 2Lite isn’t just that it’s a sub-3lbs 2P tent. It’s that it’s a sub-3lbs 2P tent that’s as livable as heavier alternatives. Even zipped open, the large rain fly shields the tent’s two D-shaped doors from wind and rain. Those doors are incredibly large, reaching from the tent’s roof all the way to its foot. At 28 square feet with a 41-inch head height, the floor area may only sound equivalent to those two Big Agnes tents, but unlike them, its walls are nearly vertical, leading to a livable interior for two. It’s like the space of the Copper Spur in the package of the Fly Creek. The 2Lite’s poles fold up into bundle less than a foot in length, making them very easy to pack. Slingfin is a new brand from legendary tent designer Martin Zemetis. He started at The North Face in 1982, designed tents for Sierra Designs for 8 years, then worked at Mountain Hardwear for 15 years, until that brand was bough by Columbia. In the few short years Slingfin has been around, it’s made a name for itself as producing the strongest mountaineering tents on the market. That strength is thanks to an innovative “web truss” design, that provides structure and tension for the poles, separate from the tent body or fly. The 2Lite Trek employs a rudimentary web truss to secure your trekking poles, but this regular 2Lite we’re testing here does without. What innovation has Martin brought to its design? Martin’s right, this tent get’s scary tight. Setting it up, you clip the perimeter of the tent’s body to the poles, as normal, then use H-clips to further add tension. Internally, these reach to tensioned cable that spans the head of the tent (it doesn’t reduce head room), adding further structure. The 2Lite is a non-freestanding design, meaning you have to stake it fore and aft to hold it up. Tension front to rear is what combines with the lateral poles to hold the thing up. Stretched over the poles is an expansive, to-the-ground fly that’s much wider at the head than it is at the foot, creating those vestibules and sheltering them and the doors from wind and weather. It’s a simple, clever solution that creates effective wind breaks for the doors and large, covered storage areas. The entire body of the tent is mesh and is separated from the fly most of the way around by a 6-inch gap. There’s no vents in the fly, but the vestibules can be partially or fully opened for extra airflow while still keeping wind and rain out. Folding into a 13x5-inch bundle around the poles, the 2Lite should easily fit into even the tightest of packs. Setup is intuitive and quick, once you get your head around how tightly tensioned everything becomes in the end. That tension is actually reassuring; even without using the guy lines, the tent conveys an immense feeling of strength. Oriented with its head into the wind, so that the vestibule “wings” keep the wind off the doors, there’s a solid pocket of still air along the rest of the tent body. We haven’t used it in the rain yet, but judging by its performance in wind, it should do a fantastic job of keeping you dry, even with the vestibules open partially. Inside, you’re treated to a seven-foot-long living space that’s 51 inches wide at the head pole. You’ll have an extra foot or so of length at the head or foot to store your pack or odds and ends, but there’s plenty of room for those in both vestibules as well. You can sit up and easily change your pants inside the tent. That foot pole loop really helps expand livability, as do the flat sides of the tent body. You do not find yourself constricted at all, as you do in the BA Fly Creek. On hot nights, rolling the vestibules up fully provides excellent ventilation, while still leaving a generous sheltered area for your pack, boots or dog; Wiley loves sleeping out here. Corey spent a couple of nights in it with his wife and reports that it slept two people as comfortably as his BA Copper Spur. As with any lightweight tent, the two of you should be comfortable sleeping in tight quarters, but unlike many tents of this weight, you’ll both actually be comfortable and even have your own doors and vestibules. Every seam, every connector, ever stitch and every cord feels solidly put together and of high quality. I could find no loose threads, runs or areas of concern, quality wise. Two doors for two people, both of which are extremely large and easy to enter and exit through. The wing-like vestibules provide an extraordinary large sheltered area for storage while keeping wind and rain off the doors and providing dry entry. The “clam cleats” on the vestibule guys provide strong, simple, infinite adjustment of vestibule tension. We hope to see these used elsewhere. The four-inch-high bathtub floor combines with the to-the-ground rain fly in a way that should totally keep out even wind driven rain and splash back during downpours. Ventilation is excellent with the vestibules partly open. Excellent use of space inside means you can actually, really sleep two full-size adults in comfort. Handsome colors and logo feel upmarket; the grey fly blends in well to your surroundings, whether you’re camping in a dense forest or on an exposed mountain. Nowhere is your body pressed against the tent body while you sleep. Slingfin is best known for its indestructible expedition shelters like this 7-meter dome. Non free-standing design means you need firm dirt to achieve adequate stake tension. Anywhere else, you risk flapping in high winds. No vents on rain fly mean you have to have vestibules at least partially open for ventilation. Mesh storage pockets sag with any weight in them. 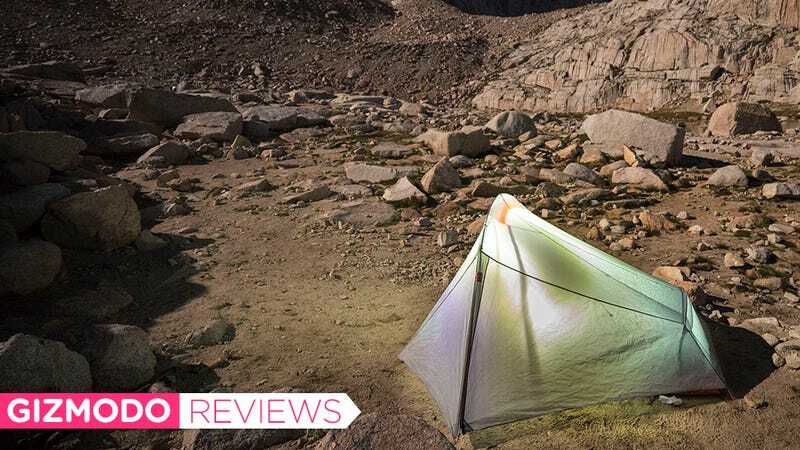 For just $329, Slingfin has delivered a sub-3lbs 2P backpacking tent that’s uniquely strong, imminently practical and surprisingly spacious. Understand that this is a technical backpacking tent for people who prioritize low weights and small packed sizes. It is not a spacious family car camping tent or a cheap POS you’d buy for once-a-year use. As a high quality, lightweight home-on-the-mountain, we can’t think of a better product. You will be happy with this tent. It also has us excited for the other products Slingfin has in development. Expect technical clothing, a range of backpacks and even a new, ultralight 4P mountaineering tent that should weigh just 4lbs.